A student operates a machine at a COM Career Exploration Day. 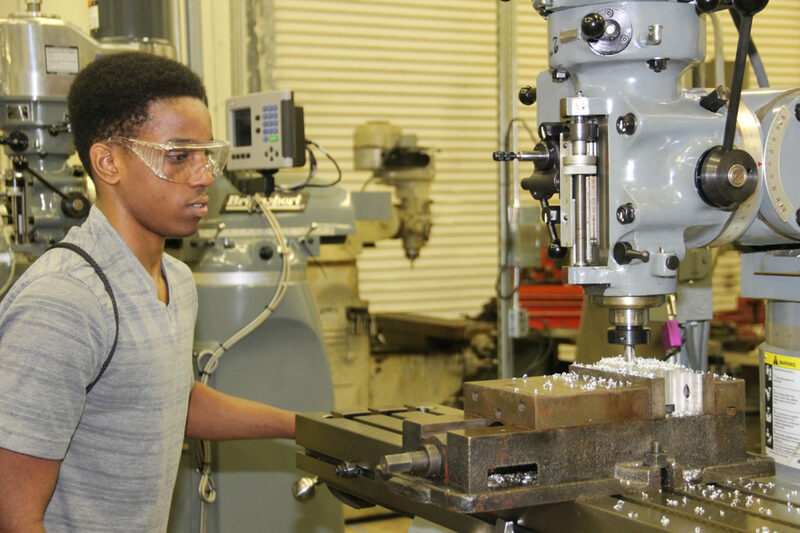 The third annual Career Exploration Day, June 14, 8 a.m. to noon, is free to students who have completed grades 7 to 12 to explore careers from welding to nursing. High school students can investigate a crime scene, explore firefighting or discover more about health care robots during a hands-on Career Exploration Day this summer at College of the Mainland. The third annual Career Exploration Day, June 14, 8 a.m. to noon, is free to students who have completed grades 7 to 12. Students can select one of four hands-on tracks depending on their interests: health care, public service, cosmetology and education, and industrial trades. The nursing and allied health track will let students explore nursing and other growing health care fields to determine which fits their abilities. The cosmetology and education track will showcase the rewards and roles of teachers and cosmetologists with interactive activities. The industrial trades track will highlight welding, mechanical maintenance and other skilled crafts with hands-on projects. It is free to students who sign up. Call 409-933-8462 to register by May 31. Celebrating 50 years of student success, College of the Mainland offers a variety of fully accredited associate degrees and certifications. Summer registration is now open. The college prepares students to meet their goals, whether transferring to a university or entering the workforce. An Achieving the Dream Leader College, COM has an excellent professor-to-student ratio that allows instructors to connect with each class. We’re the launch pad for success throughout the Mainland. For more, visit www.com.edu.